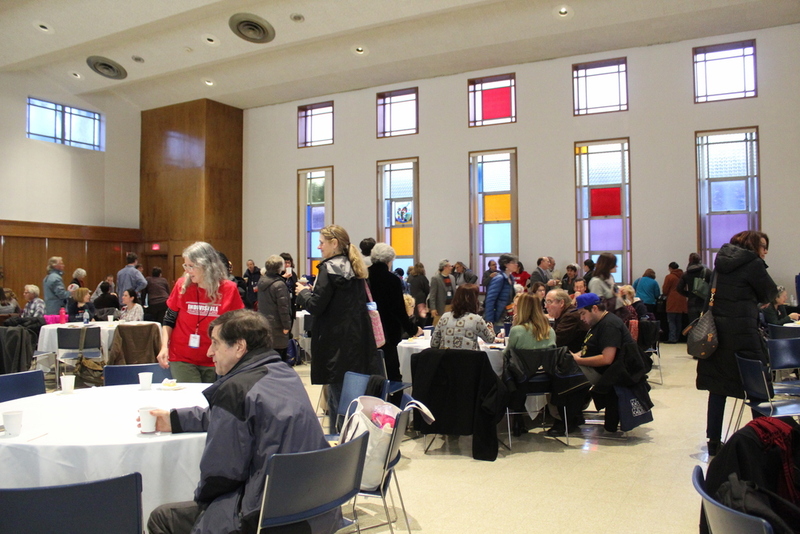 We were excited to see so many of you at Sunday's Massachusetts Indivisible Conference! This issue of the Muster echoes many of the themes discussed at the conference. 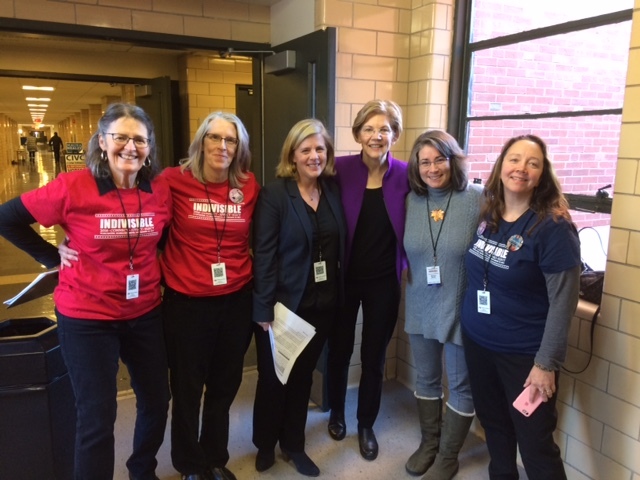 Senator Warren's keynote speech stressed the need to protect our democratic institutions and fight against the GOP tax proposal, and many speakers and workshops focused on the upcoming elections. This week, the Muster shines its spotlight on the Democracy team which is taking action on everything from pushing to expose government corruption and the impact of foreign meddling in our elections to resisting the Trump administration's assaults on immigrant rights, human rights, and our voting systems. At the top of our suggested Morning Coffee Actions is another plea to fight back against the Trump Tax Scam - this giveaway to large corporations and the wealthiest in our society is not only unfair, the deficits it creates will jeopardize all the programs and progress we have been fighting so hard to preserve. 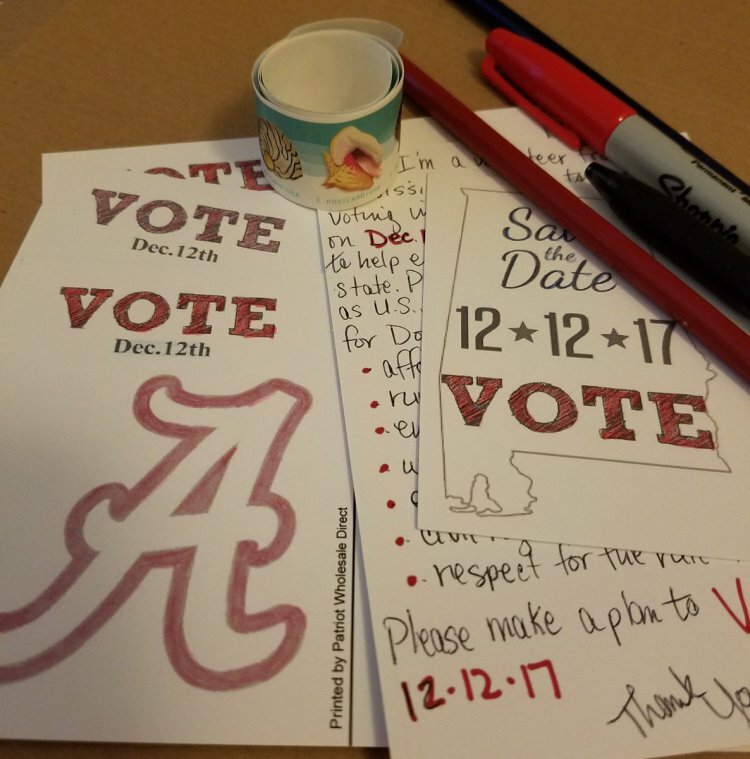 Finally, we suggest several ways you can get involved in upcoming elections from sending postcards to Alabama voters about next month's special Senate election to attending fundraisers for some of the exciting progressive candidates running for Congress in 2018. The Democracy team has several sub-teams that focus on various issues. The main ones at this point are RussiaGate/Conflicts of Interest, Immigrant rights, Human rights, Voting rights and Gerrymandering, and "What about Charlie Baker?" Updates from each sub-team are given below. The RussiaGate sub-team is busy keeping up with the latest on the Russian influence and potential collusion in our 2016 election. Indictments have already been handed down and when we heard these were the “first indictments,” we quickly utilized the concept of “thinking beyond the sale” (a strategy perfected by President Trump) to conclude that there will be more. We continue to encourage everyone to sign up for the "Mueller Rapid Response" in case Trump fires Robert Mueller and to commit to being prepared to take to the streets if that happens. In addition, we ask everybody to call your MoC and urge them to protect Mueller's investigation and press for sanctions on Russia - see the Morning Coffee Action section for more details. Hardly a day goes by that there isn’t another revelation - check out investigaterussia.org for the latest information and consider signing up for their excellent daily briefings. Protecting the Constitution means protecting Immigrants. Members of the Democracy team are involved with ACLU People Power initiatives to advance the rights of immigrants. 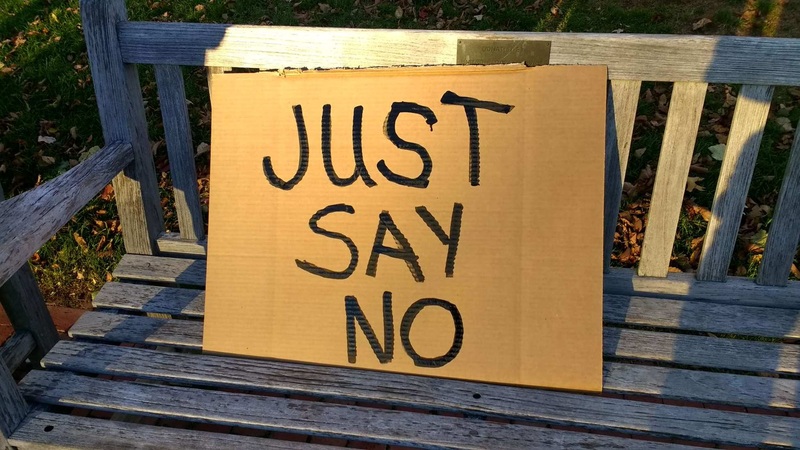 The local People Power group is working on a proposal to make Lexington a “Welcoming, Inclusive, Safe Community” and to foster a community dialogue about the issues facing undocumented immigrants who live, work in, or visit our community. Meetings have been held with Lexington's Chief of Police, the Lexington Interfaith Community Association, and the Lexington Human Rights Committee to share perspectives, raise awareness, and define the best path to addressing undocumented immigrant concerns. This sub-team has also been keeping up with developments relating to the recent State Supreme Judicial Court ruling that local authorities can't detain people based solely on Federal "ICE" detainers and urging Governor Baker to drop the bill he proposed in response to this ruling. 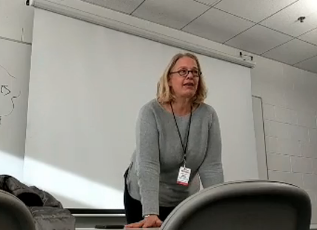 One of our members has been busy taking courses this fall to help provide our team with better information on discrimination in our communities. The Arlington Community Education course, A History of the World Through Muslim Eyes, is based on Tamin Ansary’s book Destiny Disrupted: A History of the World through Muslim Eyes. One important lesson from the course was the explanation of the different types of Islam: the Sunnis and the Shi’a, and, within the Shi’a, the Sufis. Islam is by no means a monolithic religion with all Muslims following the same exact rules. The second course, at the Cambridge Center for Adult Education, was titled White People Challenging Racism: Moving from Talk to Action. This intensive five-week course was very interactive, self-reflective, and included a lot of role playing. These courses broaden our knowledge of Americans with different religions and skin colors and help us fight against the demonization of these groups. The team will be discussing whether we can bring one or both of these courses to Lexington for the benefit of our members and the community. We suggest taking one of these tests designed to measure implicit bias. Implicit bias is “thoughts and feelings outside of conscious awareness and control.” The available tests include Race, Skin Tone, and Arab-Muslim. There is even one for Presidents that measures your preference for George W. Bush and Donald Trump! While our Elections team is working to flip the House in the 2018 elections by supporting candidates in key races, this Democracy sub-team is focused on the underlying factors that shape all elections. We are watching developments with the Election Commission appointed by Trump (which was recently sued by one of its own members), supporting efforts for Automatic Voter Registration in Massachusetts, and exploring ways to fight gerrymandering. 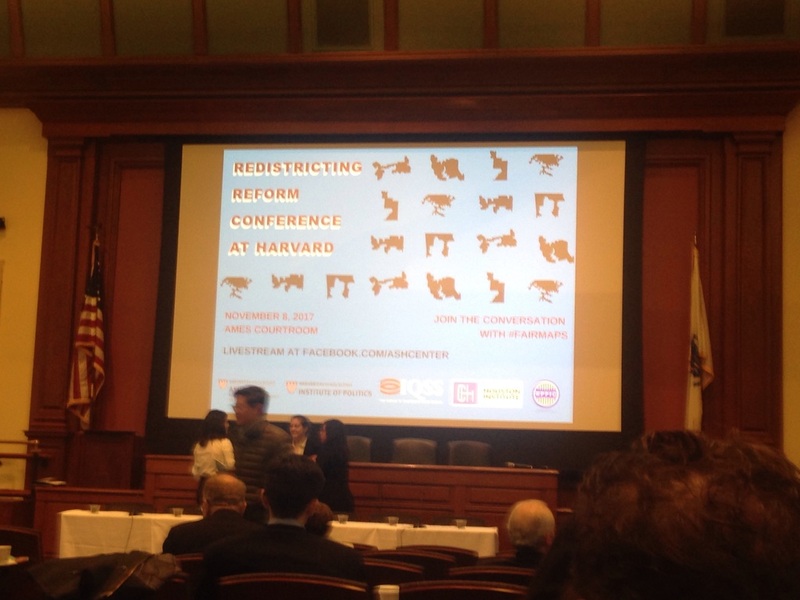 We attended a recent conference on gerrymandering and redistricting at Harvard and sub-team members attended and helped video the voting rights workshops at this week's Massachusetts Indivisible Conference. We continue to track Governor Baker and issue weekly actions to call attention to his positions and policies. As this article indicates, Donald Trump's election has made Governor Baker’s job more difficult. For many issues, Governor Baker disagrees with the President and, on several occasions, has had to speak out against his actions or words. At other times (such as his proposed bill on detaining immigrants described above), the Governor's policies have been more in line with the Trump administration - these are policies we want to track. But when the list of disagreements becomes pronounced, one has to wonder why Governor Baker is still a Republican - it certainly isn’t a requirement in the Commonwealth. We are thrilled to announce that we are organizing a Candidates Night for the Democratic candidates for Governor. Pencil January 10, 2018 on your calendar - we may also schedule an additional date (e.g., to allow for wintry weather). With so much activity going on in our team, we have also decided to set up our own Twitter account and will be announcing our new Twitter handle soon! 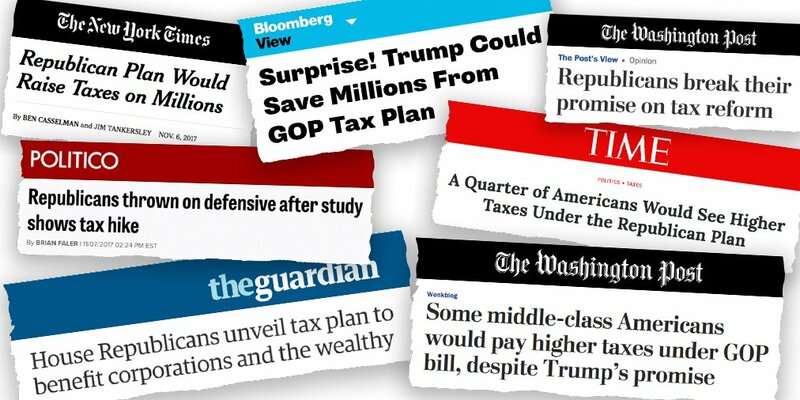 Stopping the #TrumpTaxScam that provides tax cuts for the wealthy paid for by the rest of us, is still our top priority this week. The House will be voting on its proposal later this week, then the action moves to the Senate with the goal of having a bill on Trump's desk before Christmas. 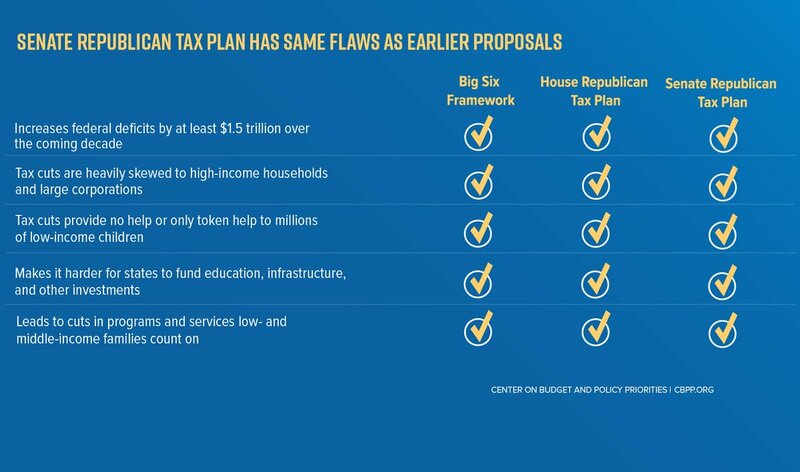 While the Senate bill has some features that differ from the House plan, the basic impacts are the same - both proposals favor corporations and those with inherited wealth at the expense of wage earners (even high wage earners). Do you post about political issues on social media? 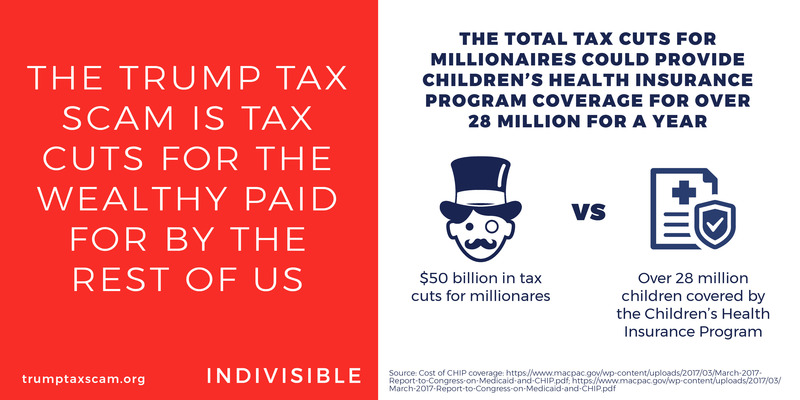 Use these great graphics created by the Indivisible team to show the potential impact of the tax bill on funding for other programs. Select the issues that are most important to you and click to tweet about them or copy the images to post on other social media or include in an email to friends and family. 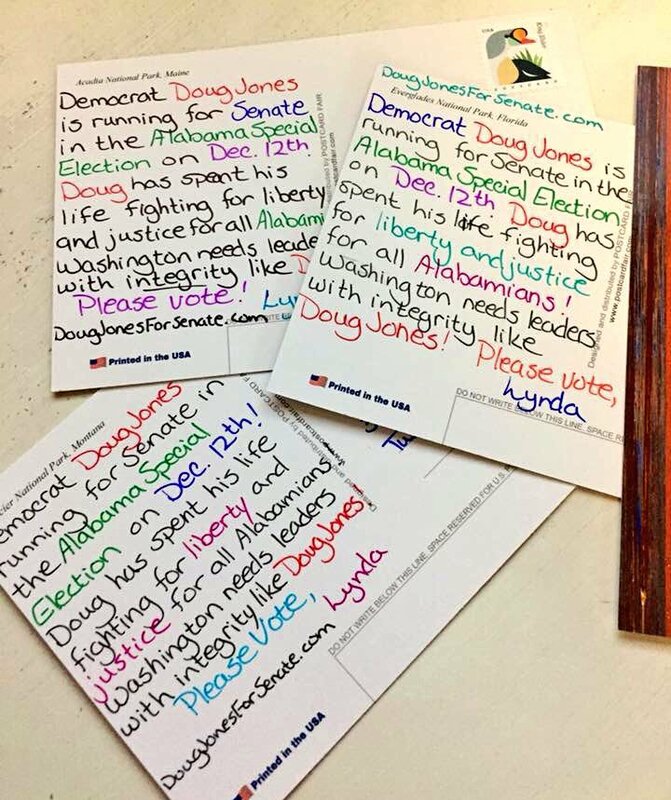 Postcards To Voters is a grassroots organization that is sponsoring a postcard campaign for Doug Jones. 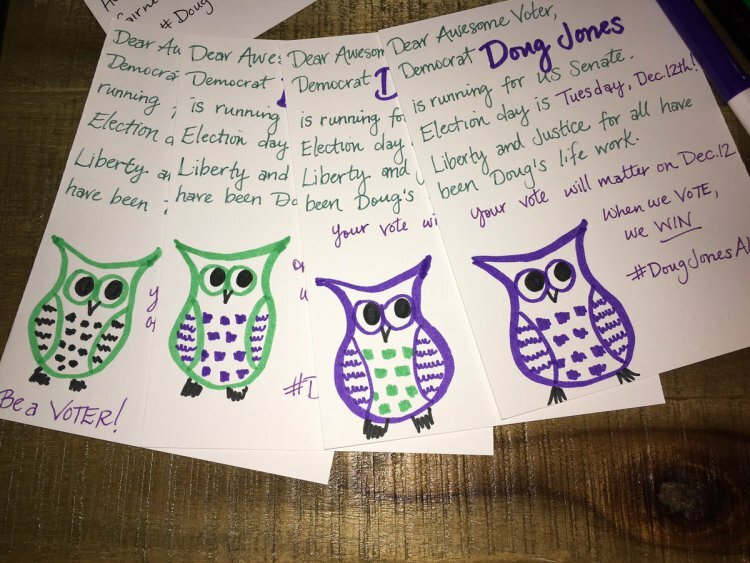 RSVP to join with other members at a postcard party in Lexington this Sunday, 11/19, at 6pm (see our closed Facebook group or email the Elections Team for details). If you can't make the party, it's really easy to do this on your own. The various ways to get started are described here. They start by providing you with clear instructions and ask you to email back a picture of your first postcard. Once they've approved you, you can request as many names as you like. Now is the time to encourage Alabama's Democratic voters to VOTE. Let's do all we can to protect Mueller! Rep. Matt Gaetz (R-FL) has introduced a resolution calling on Mueller to resign. Call your Senators and urge them to support S.1735, the Special Counsel Independence Protection Act, or S.1741, the Special Counsel Integrity Act, then ask your Representative to support H.R.3771, also called the Special Counsel Integrity Act. Please ask your MoC to also make a public statement that the firing of Special Counsel Mueller by Trump would be completely unacceptable. It’s the duty of Congress to serve as a check on Trump and prevent him from sending our democracy into a tailspin. Please call your MoC and tell them that it is not acceptable for President Trump to miss the deadline for imposing sanctions on Russia. A bill requiring new sanctions passed overwhelmingly in both chambers of Congress in July, and President Trump signed the “Countering America’s Adversaries Through Sanctions Act” on August 2, but the administration missed the October 1 deadline to “issue regulations or other guidance.” In response to Congressional pressure, the Administration sent Congress a list of possible Russia sanctions on Oct. 26, but no sanctions have been imposed yet. The Trump administration is proposing a significant increase in fees at 17 of the most popular National Parks including Yosemite, Yellowstone, and Grand Canyon in the West, and Acadia and Shenandoah in the East. During peak-season, the entrance fees at these parks would be $70 per private, non-commercial vehicle, $50 per motorcycle, and $30 per person, more than double (and in some case, triple) the existing entrance fees. Make a public comment before 11/23/17 and also call your MOCs and tell them that you strongly support our Nation Parks Service system and that it deserves funding, but increasing the entrance fee makes it more difficult for people to afford to visit these public lands that have been set aside for the enjoyment of all Americans. 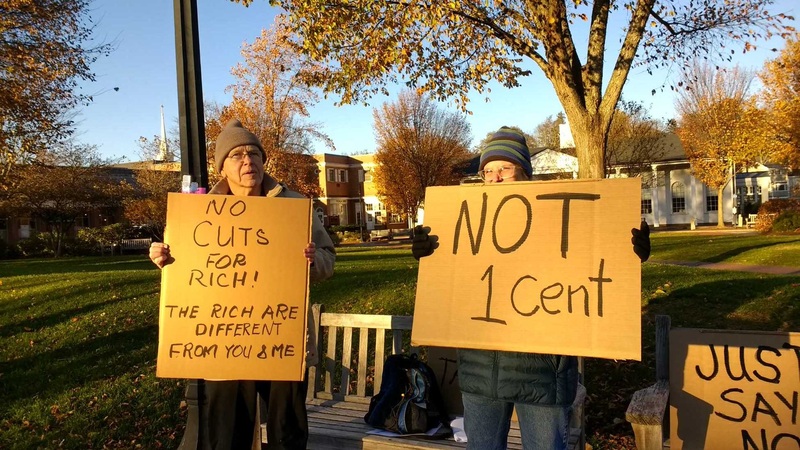 Temps below freezing and wind chill in the teens didn’t stop our #TrumpTaxScam event last Friday in Lexington Center. Thanks so much to our sign holders (including several who left before the photo) and to the citizens who stopped to talk about the details of the GOP tax proposals and take postcards to send to their MoC. 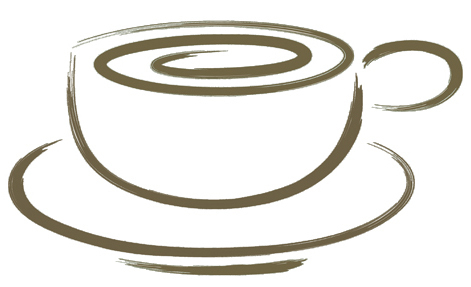 Afterwards, we headed to Peets to warm up and chat over cups of hot cocoa. 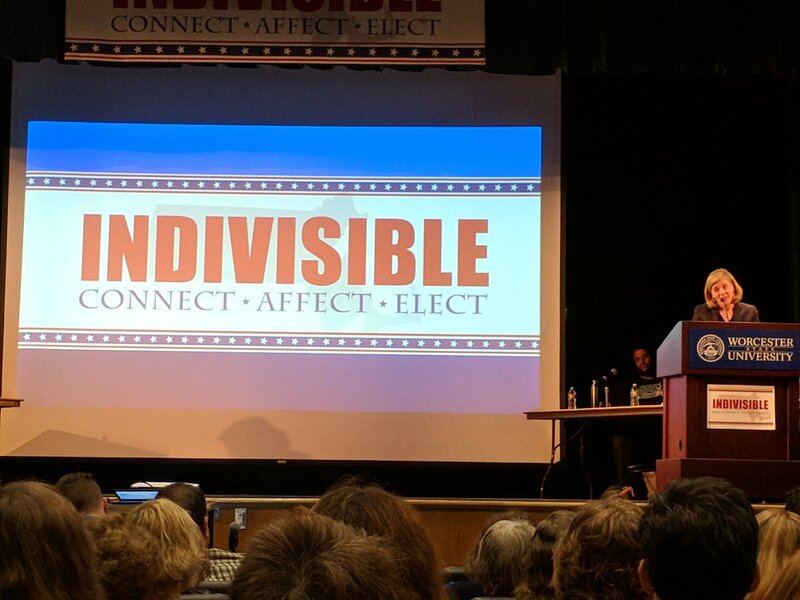 Massachusetts Indivisible Conference was a Huge Success! 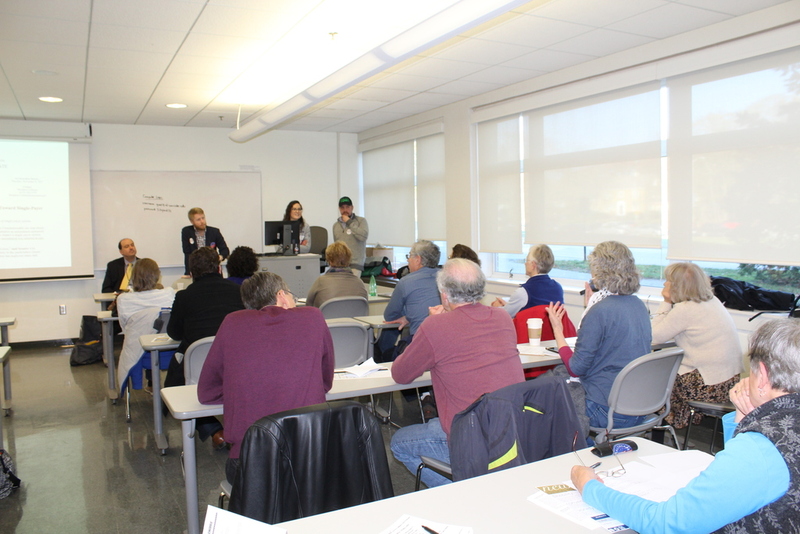 More than 30 members of Minuteman Indivisible joined over 500 other progressive activists at last Sunday's Massachusetts Indivisible Conference at Worcester State University. 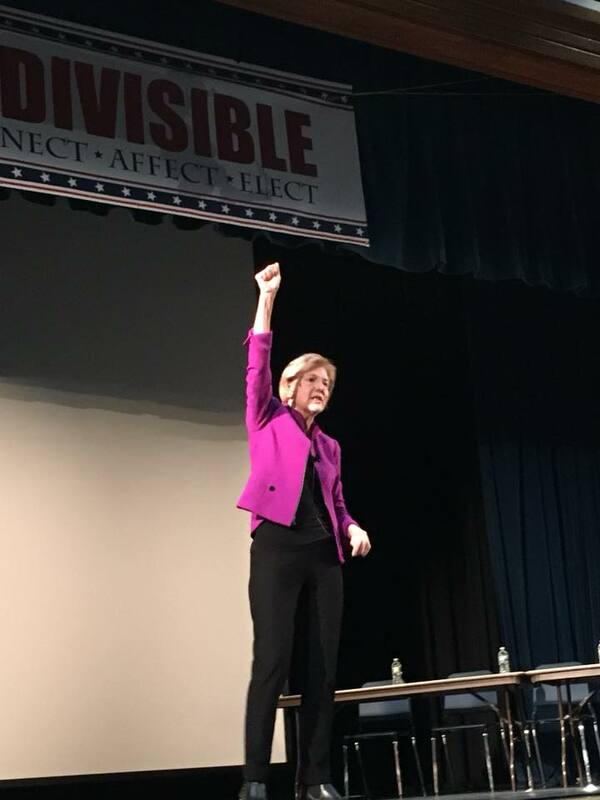 Senator Elizabeth Warren gave a rousing keynote speech - she emphasized the threat the current administration poses to our basic democratic institutions and also urged everyone to fight the current GOP tax proposal. Our own Michelle Olson spoke about the importance of flipping the House in 2018 during the morning plenary session and was also one of the panelists in the afternoon workshops. 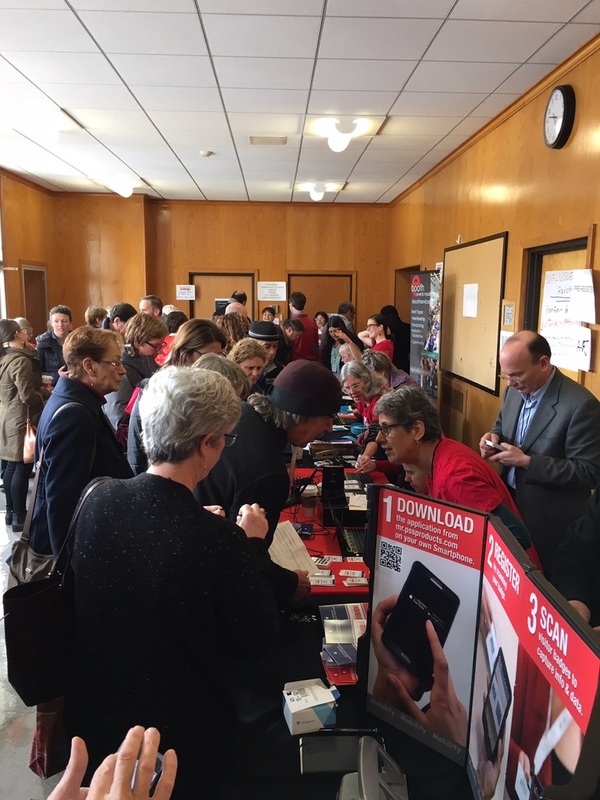 The conference ended with a lively networking session and information on future plans to make it easier for Massachusetts Indivisible groups to collaborate and grow stronger! We'll have more lots more information about the conference in future issues of the Muster including links to videos of the morning speeches and handouts from the workshop sessions. Join us as we continue discussing Dark Money by Jane Mayer and The Third Reconstruction by Rev. Dr. William J. Barber. You can use this form to RSVP or to indicate books you’d like to see us discuss in the future. An "OPEN HOUSE" retrospective with "Your State Representative: Looking Back, Looking Ahead." Representative Kaufman will reflect on his years in the Massachusetts House of Representatives and invite you to reflect with him. He'll then look ahead to the challenges and opportunities for his 24th year, and then beyond. Questions can be submitted in advance by email, jay.kaufman@mahouse.gov, or you can tweet your questions to @repjaykaufman. Collusion with the Russians. Gerrymandering. Voter suppression. ICE roundups. Racism. If these issues are important to you, then join the Democracy team and help us support policy changes and keep the pressure on. Take advantage of this opportunity to ask questions or share your concerns with State Senator Cindy Friedman. Join us as we work on planning actions to resist efforts to sabotage the Affordable Care Act and cut healthcare funding in the tax plan. New members welcome. Join us as we work on a craft project, either sign making or something similar. Feel free to bring a bagged lunch or snack. We're one year out from the 2018 midterm elections - are you ready to help us flip the House? The MI Elections Team is supporting 3 candidates for Congress, and we're looking at more. Join us to hear our strategy and get involved. Newcomers are always welcome. Early Fundraising Makes A Difference! Early fundraising for 2018 midterm races is crucial to progressive candidates seeking to challenge Republican incumbents. 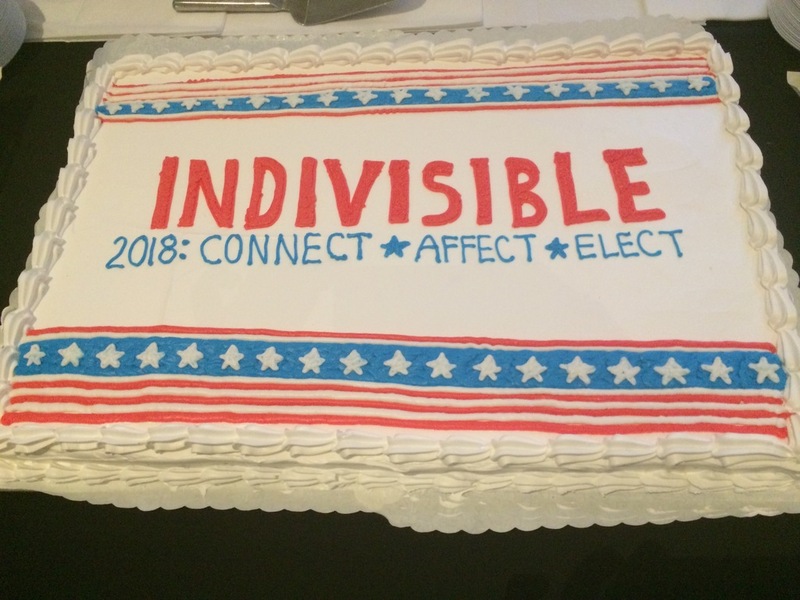 The Elections Team has already hosted separate fundraisers for our chosen candidates, and many other Indivisible groups in greater Boston are doing the same. Here are a few upcoming fundraising events for your consideration - remember that your dollars go a long way at this early stage in the game, so be as generous as you can, please! 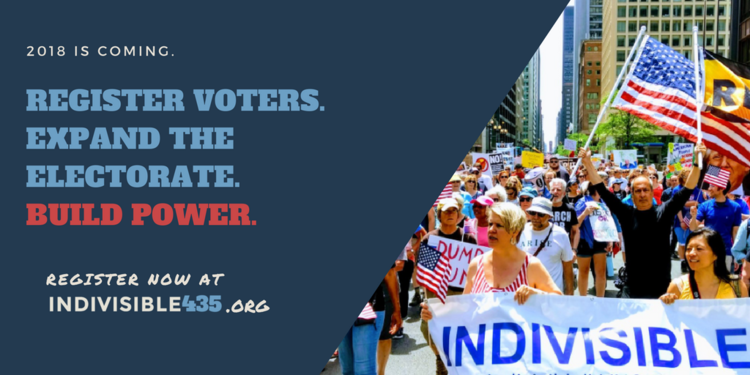 This week the national Indivisible Team launched a new website, Indivisible435.org, focused on preparing for the 2018 elections. Read about their new electoral strategy and check out their guides on electoral politics, voter registration, and making endorsements. Run for Something, a new organization helping young progressive candidates run for state and local offices, helped many candidates win election in Virginia and other states last week. 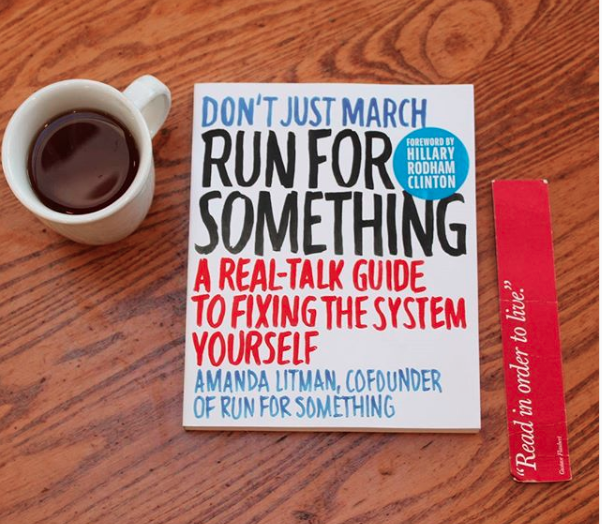 Whether you’re helping to elect candidates, interested in how campaigns really work, or thinking of running for office yourself, check out their website and pick up a copy of their new book.